Baking is hard. Not just hard but difficult. I get a vision in my mind and I want to create it. I know exactly how I want it to look and exactly how I want it to taste. Does my wish for this charming and glamourous cake become a reality for? Kinda sorta in this case. It looks so very amateurish and you want to know why? I am an amateur. I am a newbie on the food scene. I am a food blogger but I never tout myself as being a professional in any sort of way. For me, this blog is about the whole entire learning process of cooking and baking and food exploration. I am completely self-taught and I am learning something new every single day on this journey. Today I baked a bubblegum cake. I had that vision in my mind. However, things did not go exactly as planned. Let’s see here… my buttercream was way too thin and runny and it was just DROOLING off the sides of the cake. I had a brand new, nifty smoothing spatula that I thought would result in perfect icing… nope! I knew my buttercream was too thin and I didn’t have any powdered sugar left to stiffen and thicken up. Cries! So a girl’s gotta do what a girl’s gotta do. I had to work with what I had on hand and make the most of an unfortunate situation. 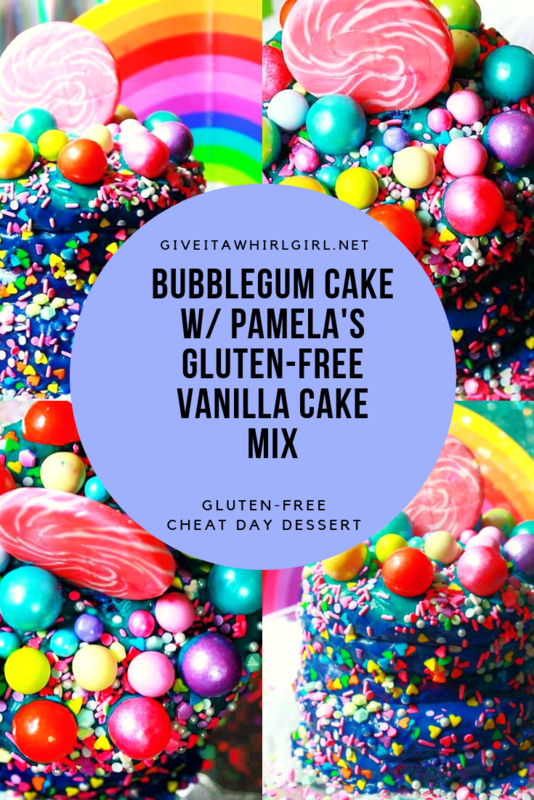 Today I will sharing my experience and Pamela’s Vanilla Cake Mix review with you. Another key product that I used in this cake was Lorann’s bubblegum flavor. Keep reading to find out more about this bubblegum cake I created! AFFILIATE DISCLOSURE: This post contains affiliate links. I receive a commission from items purchased through these links with no extra cost to you. For this cake, I used a cake mix. I am in love with Pamela’s Classic Vanilla Cake Mix. This was my second time using this mix and I am so pleased to say that this is a fabulous mix. The last time I used this mix I made a Gluten-Free Cotton Candy Cake. Click this LINK to learn more about that. It was scrumptious! This was my second time using Lorann’s Oils to flavor my cake. This time around I used the bubblegum flavor. This oil is potent stuff and a little bit goes a long way. My house sure smelled bubblegummy from baking this cake. What a wonderful scent! I have never experienced a scent like that in my home before. Just marvelous! I wish my house stunk like bubblegum all day every day! I used a rose and teal color to dye my cake. I am in love with the color teal and I was really impressed with how vibrant the color was and that is was actually teal and not just blue! The rose color also lent a stunning pink color to the cake. Yeah yeah… artificial colors. I really don’t know what’s come over me. I try to go natural as much as possible and I’ve been slipping up recently but I’m really just having so much fun! Gumballs and candy sprinkles – so pretty! Sprinkles and gumballs – eye candy candy! And to make it a little more extra special I also topped it with Sugarfina Fruity Loops. They came from the Sugarfina Cereal Collection that I treated myself too. They are to die for yummy yummy yummy! You know what? Even though my cake looks like it was made by an inept and unskilled baker I am really truly proud of it. I wish I could send a virtual slice of this cake through your screen because the taste would blow your mind. I am calling this cake, Let’s Get The Party Started”. There is no party happening here… not a party in sight. But you know what I want to celebrate today? Life! I have been feeling incredible the past two months since I started this food blog. I feel so revived and renewed. I feel like a whole new better ME. That is enough reason for me to bake a cake and celebrate! I’m also going to give myself an A for effort because I really did work my booty off on this creation! Hope you all enjoyed this pretty long post about my bubblegum cake! What are you going to celebrate today? Could be anything. Drop me a comment and let me know and let’s get the party started OK? You might also love this post! CLICK THE IMAGE! This entry was posted in My Cooking Journey, Product Reviews and tagged baked cake, baking, bubblegum, cake, candy, candy sprinkles, cheat day, dessert, food, food blogger, gluten free, gumballs, lorann oils, michael's, miles cake and candy, pamelas, pink, rainbow sprinkles, rogers bulk candy and ice cream, sugarfina, teal. Bookmark the permalink.